Siddhartha Lal rolls the first Royal Enfield off the line at new factory in April. 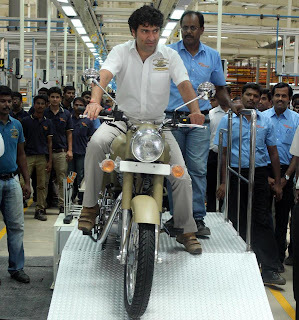 Part discussion of Royal Enfield motorcycles, part restaurant review, India's Business Standard reported Aug. 23 on its lunch with Siddhartha Lal, CEO of Eicher Motors, builders of Royal Enfields (and big trucks) in India. As usual, the confident and optimistic Lal impressed his interviewers with his youthful attitude (he's 40) and grasp of his business. The Business Standard interviewers wanted to know where Royal Enfield goes from here. This is where it gets interesting for a reader outside India. First, Lal predicted that Royal Enfield will continue to grow in India. "Motorcycles are the core of personal transportation in India and it will grow as people grow more affluent and move up from cycles," he said. Royal Enfield will offer these buyers an "evocative" mid-size motorcycle with a proud brand name they can enjoy even when not commuting. Meanwhile, in countries where motorcycles are a leisure activity (the U.S., etc.) buyers are no longer as rich as they used to be. "There is space for interesting, brand-led, evocative mid-size bikes. That's what we want to build," Lal told the Business Standard. The Business Standard said Lal used the word "quirky" to describe the existing export market for Royal Enfield motorcycles. That's an amusing term but probably accurate. Royal Enfield buyers in the U.S. likely know the history of motorcycles and appreciate the styling and "quirky" mechanical habits of British motorcycles of the 1960s. Can Royal Enfield move beyond that (count me in) quirky market, selling "mid-size bikes" that are at the bottom edge of Interstate capability? There's lots more in the Business Standard article. See if you can read between the lines as the interviewers attempt to draw out their subject on the Eicher partnership with Polaris and other matters. I live in Mexico, and smaller bikes are family, and business transport here. I'd like to see Royal Enfield open up a branch in Mexico. I think they'd do well.